Unmoored Liquid Natural Gas (LNG) pricing, declined LNG delivery, mothballed LNG capacity, asset sales, write downs. 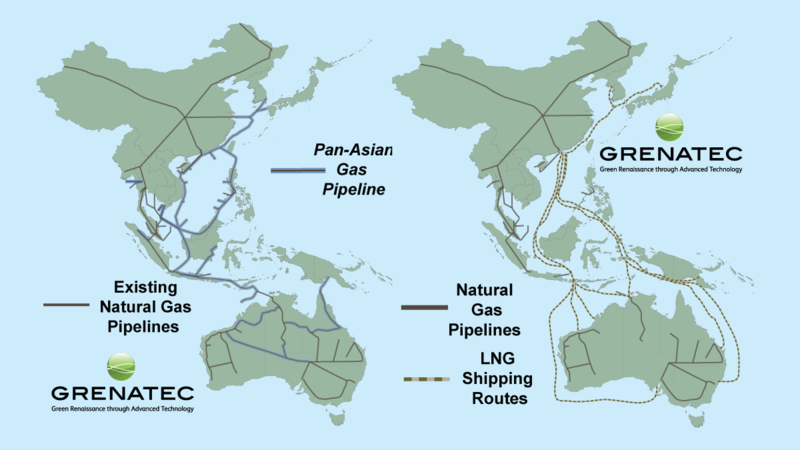 A Pan-Asian Gas Pipeline (at left, above) provides Asia a much longer, lasting, flexible, economically-valuable energy infrastructure than single-generation, greenhouse gas- intensive Liquid Natural Gas. Click image to enlarge. Asia’s LNG market is in multi-hundred billion dollar chaos. That’s good news for the future. 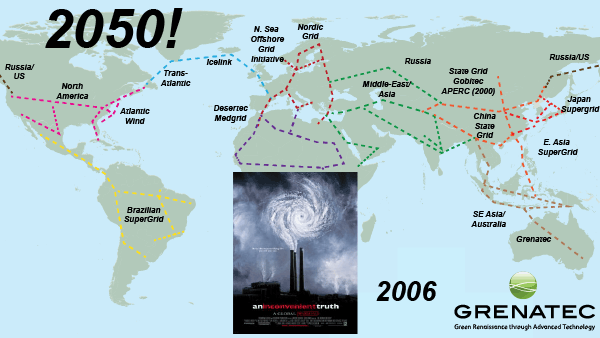 The intra-Asian LNG industry is a result of government capture by fossil fuel interests. It makes no sense on economic grounds. The distorted results are now on display: bloated construction costs (Australia), environmental degradation (Australia: Great Barrier Reef), overcharged buyers (Japan) and uncounted/uncosted carbon emissions (everywhere). A painful economic process of adjustment now has several years (and bankruptcies) to run. It won’t be pretty. It could have been avoided. Applying proper economics from the start, an intra-Asia LNG industry wouldn’t have taken root. The reason is that natural gas pipelines are better, cheaper and longer-lasting. Proper application of ‘demand-pull’ economics would have shown this. The LNG industry instead sought ‘supply-push’ economic rents through technological ‘lock in.’ The bet’s gone bad. For intra-regional trade, LNG has fundamental flaws. First, renewables are rapidly achieving cost parity with natural gas. This undermines the rationale for long-term investment in natural gas, let alone a grossly expensive, single-purpose bespoke infrastructure to deliver it. Second, ignoring LNG’s carbon emissions distorts LNG’s poor investment economics. But nstead of making rational calculations based on all economic factors, the LNG industry flattered LNG’s economics by excluding carbon. Third, adding carbon prices to LNG’s ‘life-cycle’ emissions raises costs dramatically. Faced with this, the LNG industry merely excluded carbon emissions (and their costs) as irrelevant. They won’t be irrelevant for long. In the next five years, global carbon market reform will deliver broader coverage and much higher prices (to $20-$50 per tonne). These will expose LNG’s poor carbon economics. Fourth, capital costs of pipelines are lower than for LNG. For intra-regional transport of natural gas, pipelines represent a better deal on both economic and technology grounds. Government capture– however — tilted decisions toward more LNG, a more lucrative business for industry. That bet’s now going wrong. The result is an albatross industry. The evidence: an oversupplied regional Asian LNG market where spot market prices have fallen so low they now more than offset financial penalties of failing to honor long-term delivery contracts. That, in turn, is rapidly breaking down the industry’s preferred sinecure of long-term pricing. It’s the horror scenario for LNG insiders who deliberately excluded key variables from their economic analysis. These include carbon pricing and the advantageous multi-fuel advantages of pipelines. Billions in write downs will follow over time, revising downward future calculations about the intra-Asian LNG market’s economic value. That will lead to consideration of alternative delivery methods for natural gas that are less capital and carbon intensive. The problem is one of vertical integration. LNG producers mine the gas, build the LNG shipping facilities and LNG ships. They’ve bet the farm on everything going right with all three all the time.